We’ve decided to list some common questions we get and attempt to give our best answers! Organising a Genset to be installed isn’t easy and there may be some things you’re still trying to get your head around, hopefully we can help you with some of the info we have collected below! What’s the difference between kVa and kW? First of all Kw will show you the unit of real power and kVA will show the unit of apparent power. To distinguish between the two it is important to understand the power factor (pf). A Diesel generator will usually have a power factor of 0.8. For example a 100 kVA Diesel Generator has an apparent power (kVA) of 100 and a power factor of 0.8. The real power of the generator (kW) will be 80 kW, which is 0.8 times the amount of kVA. If the power factor was 1, both kVA and kW will be equal. In summary, you can’t go wrong by using kW as your standard measurement. kW is essentially the correct power reading. 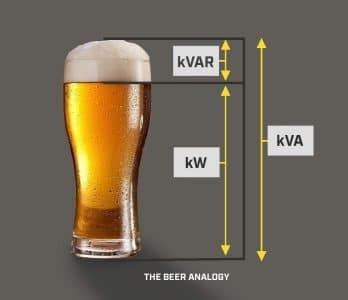 See the Beer analogy we’ve constructed between KW and kVA below! Can you convert a 50 Hz generator to 60 Hz? Yes you can convert a Diesel Generator from 50 Hz to 60 Hz and vice versa. 50 Hz is the standard in Australia. For a Generator to produce 60 Hz the engine speed will need to be increased from 1500 rpm to 1800 rpm. On the rare occasion that you will need to change the frequency it will need to be modified by qualified power generation electricians. Can the voltage be changed in a Diesel Generator? Yes, generators can be reconfigured to produce different voltages. Any modifications to the generator alternator must be carried out by a suitably qualified electrician. What does an Automatic Transfer Switch do? An Automatic Transfer Switch (ATS) is installed along with a standby generator to automatically transfer power from the utility when the main power fails to a standby generator. In simpler terms it directs the power sources like traffic. When the ATS detects a main source power failure it will signal the engine panel of the back-up Diesel Generator to start up the generator and it becomes the source of power. When the main source of power is restored the ATS will automatically transfer back to the utility and signal the back-up Diesel Generator to power down. Don’t be afraid to contact PR Power on how to determine the required size of the ATS required. How should you determine what size Diesel Generator you need? When looking to invest in a Diesel Generator all requirements of the site and the equipment need to be taken into account. Future growth, starting up equipment, standby or prime power the list goes on. Sizing your generator is the most crucial part of your purchasing decision. You need to make sure you aren’t under sizing or over sizing the Diesel Generator. If the generator is not the right size for the job it will not only be putting your generator at risk but also things that are connected to the generator as well. Due to the importance of this step it is highly advised when determining the size needed you deal with Generator Specialists. PR Power is more than happy to help its always a great idea to get a second opinion. Does PR Power do installations? Yes, PR Power has qualified staff who specialize in diesel generator installations.